Instead of waiting for Last Minute Uncle to decide on the dinner venue at the last minute, I suggested to mom last week that we check out Mountain and Sea House (山海樓). I've been curious about this place ever since I heard about it last year, but the place hasn't exactly been getting rave reviews from my foodie friends. In fact, most of the opinions seemed to be that it's OK... and that I should lower my expectations a little. Mountain and Sea House is located in a refurbished mansion from the Japanese occupation era - apparently once owned by a wealthy Japanese doctor. The location was taken over by the daughter of Taiwanese tycoon, who runs a subsidiary of the family empire supplying organic produce. The restaurant was opened with the trendy "farm to table" philosophy that many restaurants talk about nowadays. In their case, they do have their own farms... and seem to have established relationships with suppliers all over Taiwan for ingredients they themselves are unable to supply. We did not ask for a private room on account of the minimum spend, and were seated at a heavy, solid wooden table in the common dining room downstairs. The beautiful Japanese porcelain apparently is irreplaceable. Wild mullet roe (野生烏魚子) - we Taiwanese love our mullet roe, so I figured we should start with this. And it's usually lightly grilled. Here's it's brushed with Shaoxing wine (紹興酒) and put on a grill. Classic combination of mullet roe, leek, and radish. Yeah, the mullet roe sticks to your teeth, but I love it! Stuffed cuttlefish with three-colored eggs (三色蛋中卷) - the hollowed cuttlefish was stuffed with bits of egg, salted egg (鹹蛋), and century egg (皮蛋). Steamed free range chicken (白斬土雞) - pretty tasty, but not outstanding by Taiwanese standards. Supposedly an "aborigine" breed of chicken steamed at low temperature. Stuffed pig trotter (捆蹄) - the bone was removed and the front trotter was stuffed with pork marinated with red lees (紅糟肉). Meant to signify how husband and wife are meant to accommodate each other after marriage. Love this, especially because of the exotic spices. Too bad there was so little of it. Deep-fried prawn roll (炸蝦卷) - a Taiwanese classic. Too bad I didn't get to have it. Deep-fried dumplings with oyster and vegetable (蚵嗲) - a popular dish along coastal areas dotted with oyster farms. The dough is stuffed with diced oysters, shredded vegetables, and shredded pork before being deep-fried to a crisp. Seemingly slightly under-seasoned but still tasty. Gaozha (糕渣) - popular in Yilan County (宜蘭縣), but also found in top Cantonese restaurants in Hong Kong. This is a dish I love and would always order. Made with chicken stock, egg, corn starch, and minced prawns. The addition of minced prawns meant there were little lumps inside, and not as smooth as the other versions I'm used to. Stir-fried organic vegetables (清炒有機荷葉白菜) - this particular variant of Chinese cabbage is called "lotus leaf cabbage", and was stir-fried with Tuscan olive oil. 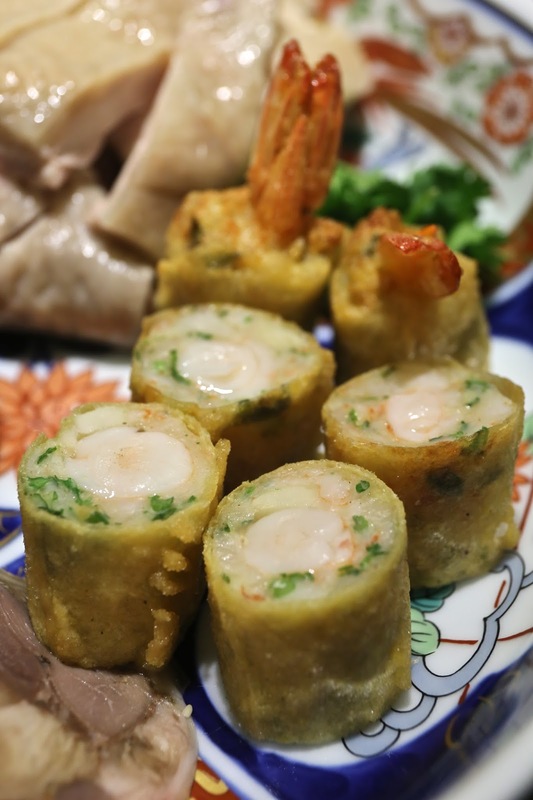 Spring rolls with flounder (扁魚春卷) - stuffed with fried flounder, minced prawn, and bean sprouts. Very tasty. Salted egg white baked beef (蛋白鹽封牛肉) - similar to dishes like salt-baked chicken (鹽焗雞) or salt-baked fish, except in this case lots of salt was mixed into the whipped egg white smothering the beef underneath. Salty pork with Taiwanese wild pepper (馬告鹹豬肉) - I love that they marinated the pork in sea salt, Kinmen Kaoliang wine (金門高粱酒), and mountain litsea (馬告). The latter gives off an interesting mix of fragrances like lemon, ginger, and pepper. Pancakes with whitebait and wild seaweed (魩仔魚野生海菜煎餅) - very crispy on the outside, and the stuffing - with seaweed from the Penghu (澎湖) Islands - were delicious. Steamed flower crab (清蒸花蟹) - I love flower crabs, and this was very fresh and delicious. I didn't need to have it steamed or cooked with anything - just wanted the purity of the crab on its own. Traditional style stir-fried vermicelli (古早味炒米粉) - whoa! Suddenly the MSG and pepper hits your tongue front-and-center. Very tasty, but just need lots of sugary drinks to rinse the tastebuds afterwards! Love the little chopped pieces of octopus tentacles for their crunch. Fried rice with mullet roe (烏魚子炒飯) - they've grated the bottarga and generously sprinkled it on top. Loooove the flavors, but once again there's so much umami and MSG... and pepper. 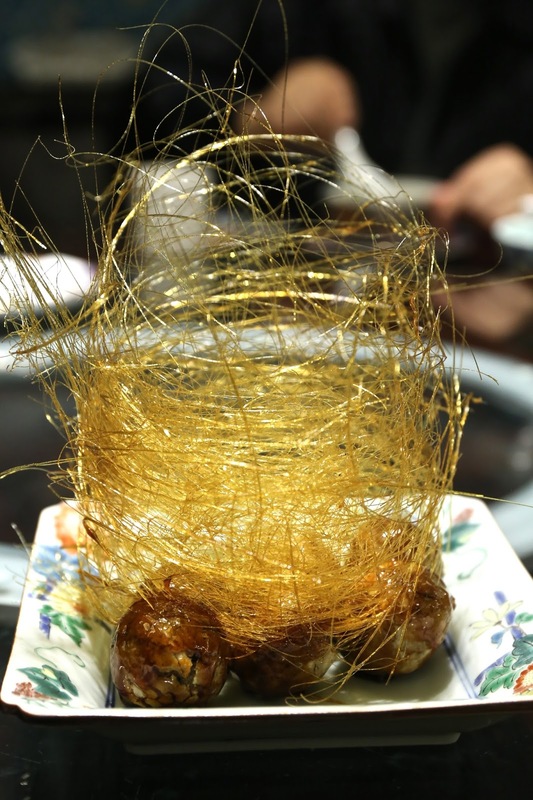 Deep-fried glutinous balls with azuki beans (紅豆煎鎚) - the sticky rice balls are OK, but it's the pretty candy floss on top that attracts attention. A pretty enjoyable meal, at least for Hello Kitty and I. I have indeed found a place that I feel is worthy of recommending to visitors. I found the food to be above average in terms of flavor. They have obviously done a lot of work in composing the menu, putting together a mix of traditional dishes along with some that are clearly more creative and required more research. A considerable amount of effort was made to source the right ingredients, with mostly local, organic, and some seasonal produce. They also care about visual presentation, and plating clearly mattered here. The traditional three criteria of a good dish: color (色), fragrance (香), and taste (味) were all important to the restaurant. Thank you for your recommendation; it’s the honor of Mountain and Sea House. Actually we really made a lot of efforts on every detail, like tableware, décor, drink and of course of the meal. First of all, we don’t use shark’s fin, the soup you saw ‘’翅’’ in Chinese in the menu, actually is “chicken wing”(雞翅). Using sharks fin is against out policy of environmental protection. It's I misunderstand your meaning or any mistake in the translation, please feel free to let me know. Second, we do not use MSG or any harmful food additive in any kind of dishes. It’s also against our policy. The ingredients of Traditional style stir-fried vermicelli is 100% rice noodle, cabbage, mushroom and sun-dried Penghu octopus. The salty taste is form octopus or maybe the chef put too much salt. Whatever which possibility, it’s not definitely put MSG in that dish. Finally, we are really appreciate your recommendation and hope to see you again soon. Thank you for clarifying. However, based on my experience, although many Chinese chefs claim that they don't use MSG, they don't think twice about using "chicken powder", which ignores the fact that many brands of chicken powder actually contain MSG. May I ask if your kitchen uses chicken powder? Regarding shark's fin: one of my friends dined at your restaurant and wrote that there was shark's fin in your 菜尾湯. I would be very surprised if this friend confused shark's fin with something else. I have also read blogs by people I don't know which mention shark's fin in the same soup. May I ask if shark's fin was ever an ingredient?